We’d love your help. Let us know what’s wrong with this preview of The Forgotten Village by Lorna Cook. 2017: Melissa had hoped a break o A timeless story of love and sacrifice, perfect for fans of Rachel Hore, Tracy Rees and Kate Morton. To ask other readers questions about The Forgotten Village, please sign up. Wow, this dual timeline story literally grabbed a hold of me and sucked me in. I was gripped and sitting on the edge of my seat with ever chapter, right to the very end. Thoroughly enjoyable. It didn't take me long to be drawn into the stories of both Veronica, Anna, Albert & Freddie back in 1943 and that of Guy and Melissa in present day 2017, I was captivated right from the first few chapters. I loved how the story went back and forth from 1943 to present day 2017 which was done so seamles Wow, this dual timeline story literally grabbed a hold of me and sucked me in. I was gripped and sitting on the edge of my seat with ever chapter, right to the very end. Thoroughly enjoyable. It didn't take me long to be drawn into the stories of both Veronica, Anna, Albert & Freddie back in 1943 and that of Guy and Melissa in present day 2017, I was captivated right from the first few chapters. I loved how the story went back and forth from 1943 to present day 2017 which was done so seamlessly. It was highly captivating, dramatic and emotional read in places, I literally could not turn the pages fast enough, with wanting to find out what happens next and as to how it would all end. I thought the story was brilliantly well written and the characters are all so very well portrayed and believable. I have absolutely loved reading this from start to finish. I'm a big fan of dual timeline stories and I'm always thrilled to come across them - whether it be historical fiction or mystery thrillers. An unforgettable and emotional read, THE FORGOTTEN VILLAGE had me gripped from the beginning as the stories both in the past and present unfolded piece by piece and had me on the edge of my seat with every page and every chapter. Right up to the very end. 1943: With Britain at war, people are affected in many ways. And the village of Tyneham in Dorset was no I'm a big fan of dual timeline stories and I'm always thrilled to come across them - whether it be historical fiction or mystery thrillers. An unforgettable and emotional read, THE FORGOTTEN VILLAGE had me gripped from the beginning as the stories both in the past and present unfolded piece by piece and had me on the edge of my seat with every page and every chapter. Right up to the very end. 1943: With Britain at war, people are affected in many ways. And the village of Tyneham in Dorset was no different. The British Army have requisitioned their little village for training purposes and everyone must give up their homes - some of which have been farmed by generations. with the promise that once the war is over the resident can return. But with war comes great sacrifice and even those up at "the great house" - Tyneham House - are to leave their home too. But on the night before they are all to leave, tragedy strikes and lives are changed forever. It wasn't long before I was drawn into the story of Veronica, Anna, Bertie and Freddie at Tyneham House. As much as I was drawn to them, some aspects of the story were hard to read and I found myself feeling such great sorrow and sadness for those involved. Abuse in the past decades is something that was not talked about, not acknowledged and definitely not seen as a crime - but rather a private matter between a husband and wife. I have read many books with an element of abuse but this one just tore my heart out. As Veronica planned her escape from her abusive husband with her maid Anna's help I found myself feeling such sadness and helplessness for them both whilst for Bertie I felt nothing but hatred. He was vile. But the whole desperation and helplessness of their story just made it all the more heartbreaking. 2018: Melissa is on holiday in Dorset with her boyfriend Liam in the hope for a romantic break together. But all Liam seems to be interested in is spending his days surfing, leaving Melissa to her own devices. However, the break turns out not to be a romantic one but something more permanent. Tyneham village, now reopened to the public, was never given back to its residents - just forgotten. But now people can go visit and one day Melissa decides on a whim to explore the forgotten village. It is here that she sees a photograph of a woman that haunts her. The expression on her face - the fear - is forged into her memory and she finds she cannot let it rest. She MUST find out who the woman is, why she looks so afraid and what happened to her. It is on her exploration of Tyneham that Melissa meets Guy Cameron, a famous TV historian, and together they discover their interest in the village. She tells him about the photograph of the woman who they learn to be Lady Veronica Standish and the man tightly clutching her hand is her husband Sir Albert from Tyneham House. When Guy reveals that his grandmother once lived in the village as a young girl and worked up at the great house as a maid, an idea forms in Melissa's head. Can his grandmother Anna reveal any clues as to what happened to Lady Veronica? But eliciting that information from Anna proves harder than expected. What is she hiding? THE FORGOTTEN VILLAGE is a beautifully written highly captivating dual timeline story that is so easy to be swept up in. It tells the story of a time when Britain was in the grips of WW2 and rather than be bogged down in historical facts, they featured only as a backdrop to a beautiful yet sad story set during that time. The present day story was a little predictable (when it came to their budding romance) but that did not detract from Melissa and Guy's search for the truth. I found myself wanting to immerse myself further into Lady Veronica's story to see where it lead. The switch between the past and the present was done eloquently and at just the right time as the secrets were unveiled. This captivating and emotional story is a simple plot and very easy to read. Whilst I found Melissa and Guy's relationship a little predictable, I don't think the rest of the story was despite having my own suspicions as to what really happened confirmed at the conclusion. And whilst love was obviously lurking in the air I didn't pick it up to read a romance but more the mystery from the past. The Epilogue was such a beautiful heartwarming touch bringing a closure to the story. Nevertheless, I was not disappointed - except at Melissa's constant berating of herself when it was so obvious otherwise - as I love being swept away in the historical past with a mystery to solve. I look forward to more from this author in the future. 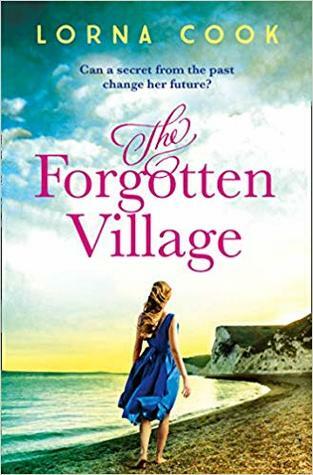 I would like to thank #Lorna Cook, #NetGalley and #AvonBooksUK for this ARC of #TheForgottenVillage in exchange for an honest review. The title ope The Forgotten Village is the perfect summer read. It really has a little bit of everything to draw the reader in and warm the heart! It is a dual timeline novel split between the modern day and the historical era of 1943. There is a mystery at the core of the title and a brilliant dash of romance! As I type that, I am aware, I am not known to read romance as such. But with The Forgotten Village I was completely taken in, as much as I was when I devoured the entire series of Poldark! The Forgotten Village was a dual-timeline story that took place in 2017 and in 1943 during WWII. With short and easy chapters that alternated between the two time frames, it was a quick book to get through. In 2017 Melissa visited the town of Tyneham that was open for the first time since it was requisitioned during the war. It was while she was there that she saw a picture of a couple that inhabited Tyneham House that she couldn't get out of her head. It resonated with her and she found herself trying to find out what happened to the woman in the picture. With her personal life in the toilet and her professional one questionable, she had the time to do some digging with the help of a new found friend. In 1943 the story went back to the couple living at Tyneham house and the turbulent and dangerous relationship they had. It's no secret that this is one of my favourite genres and that I absolutely adore dual timelines. I found myself enjoying both timelines in The Forgotten Village and liking the characters from both. It was a simple plot and I have to say that it was also pretty predictable. There were no real shocking moments or surprises with any of the outcomes. Having said that, it was still a pleasant story to read. This book was more about the relationship between the different characters than it was about the actual war. Readers who are reluctant to dive into the historical fiction genre would have no trouble with tackling this book and enjoying it. I can't wait to see what Lorna Cook comes out with next. Keep those dual timeline stories coming and I'll keep picking them up. Melissa had hoped a holiday in Dorset with her boyfriend Liam might cheer up their relationship. Instead she finds herself twiddling her thumbs whilst Liam goes off surfing! In an attempt to find something interesting to do she ends up in the village of Tyneham. This is the day it is being given back to the people after being requisitioned by the military in 1943. Whilst looking round an exhibition, she is intrigued by a photo of the Lord of the manor. It is the wife who she cannot forget. Lady Melissa had hoped a holiday in Dorset with her boyfriend Liam might cheer up their relationship. Instead she finds herself twiddling her thumbs whilst Liam goes off surfing! In an attempt to find something interesting to do she ends up in the village of Tyneham. This is the day it is being given back to the people after being requisitioned by the military in 1943. Whilst looking round an exhibition, she is intrigued by a photo of the Lord of the manor. It is the wife who she cannot forget. Lady Veronica looked terrified in the picture & she wanted to know why. He quest for the story leads her to meet Guy, the popular TV historian whose grandmother came from the the village. Running parallel to Melissa's story is the story of Tyneham in the last days before everyone left. This was a really interesting storyline. I really liked Melissa- she seemed so real & ordinary, especially when attacking the custard creams! I really loved reading this fascinating, enthralling book and am excited to have discovered this new author! I read a lot of books based in world war two but had never heard of Tyneham, The Forgotten Village before so found it utterly fascinating to learn about it. This is actually based on a true story which meant I wasted lots of time looking it up on the internet. The idea that parts of the village are still as they were when the village was evacuated intrigued me and it’s definitely a place I I really loved reading this fascinating, enthralling book and am excited to have discovered this new author! I read a lot of books based in world war two but had never heard of Tyneham, The Forgotten Village before so found it utterly fascinating to learn about it. This is actually based on a true story which meant I wasted lots of time looking it up on the internet. The idea that parts of the village are still as they were when the village was evacuated intrigued me and it’s definitely a place I’d love to visit in the future! The two timelines were very interesting and I found I enjoyed them both equally which is unusual for me. Melissa is someone I found I immediately liked as she seemed so normal. She’s impulsive, makes mistakes and is slightly ditzy at times which made her very loveable in my eyes. She’s also a lady who loves her food which made for a refreshing change! When we first meet her she is going through a hard time and lacking a bit in self confidence so I found myself thrilled about her budding romance with the very handsome Guy. I enjoyed watching their romance develop and found myself hoping that there would be a happy ending for the two of them. Veronica’s story is also interesting as it focuses on the events and feelings in the village up to the forced evacuation. However it had a bit of a serious note to it due to the sad occasion and dealt with a serious subject which combined made for a sober read. I did feel a lot of sympathy for Veronica as her situation becomes more apparent and I found I wanted to keep reading to find out what happens to her. This is a very absorbing story which is easy to lose yourself in for hours at a time. I ended up reading this far too late into the night as I was so caught up in this wonderful story. The two timelines are well plotted and engaging which makes for a very intriguing read. The mystery and unravelling of old secrets was superbly done with the two timelines coming together in a shocking but thoroughly satisfyingly way. This unbelievable is the author’s debut novel and I can’t wait to read more from her in the future. I’m normally a bit skeptical of comparisons to Kate Morton as she’s one of my all time favourites but I think it is justified in this case as I thought this book was, dare I say it, even better! I am a big fan of dual timeline stories, and always happy to come across such novels. During 2018 storyline we meet newly single and jobless Melissa who came to Dorset on a romantic summer vacation. The romantic part of the vacation didn't turn out to be as great as she had expected, especially after an awful breakup. However, coming upon a village that was requisitioned during WWII got Melissa's attention. But not the village itself, mostly one specific couple from old photographs. In 1943 part o I am a big fan of dual timeline stories, and always happy to come across such novels. In 1943 part of the novel we are being introduced to two more main characters: Anna and Veronica. As requisition approaches, both women are looking forward to leaving Tyneham. When Anna is looking forward to joining the forces to help the English army, Veronica is planning an escape from her abusive and estranged husband. Two different stories, two different timelines, the only thing that connects them is abandoned village in Dorset, England. I must say, I was a bit disappointed, as I expected to learn more of the history of the village that was forgotten after the war, however, the main focus of the novel was on a family that used to own the village. I am the kind of reader that always finishes the book, even if I find it not quite interesting. Nevertheless, the last pages contain an interesting twist in the story that made the book worth reading. When Melissa goes for a romantic break with her boyfriend Liam to Dorset things definitely don't turn out the way she plans! With Liam off surfing all the time she comes across the forgotten village of Tyneham and having seen a picture of Veronica, the lady of the manor, becomes intrigued by her story. Back in 1943 the village was requisitioned by the army just when Veronica was planning to escape, with the help of her maid Anna, from her cruel and abusive husband Bertie......... but what happen When Melissa goes for a romantic break with her boyfriend Liam to Dorset things definitely don't turn out the way she plans! With Liam off surfing all the time she comes across the forgotten village of Tyneham and having seen a picture of Veronica, the lady of the manor, becomes intrigued by her story. Back in 1943 the village was requisitioned by the army just when Veronica was planning to escape, with the help of her maid Anna, from her cruel and abusive husband Bertie......... but what happened to her? Melissa is determined to find out and joins forces with local historian Guy..... but will she get too involved? Wow, what a compelling story. I have always been fascinated with the abandoned village of Tyneham in Dorset, and this fantastic story set there was amazingly well researched and so well written. A dual timeline set in 1943 just prior to the requisition of the village, and in 2018. Long-held secrets emerge about the occupants of Tyneham House. I found this to be a very compelling read, and look forward to reading more of Lorna Book's books. I absolutely loved this debut from Lorna Cook - full of history, intrigue, romance and even a dash of humour. I liked that the story focused on real people and their relationships rather than WW2 and the war effort itself which seems almost ubiquitous in this genre right now! With characters that I could relate too and a wonderful twist in the final pages, this is a perfect debut from a talented new author. This is a beautifully written book - actually with the dual timeline, its like two beautifully written books! Both sets of stories work wonderfully, all the characters feel very real and sympathetic and both plots kept my attention. I loved the way the modern and the WW2 period entwined and over-lapped - it seemed very natural/unforced and it was fascinating to learn about the requisition of Tyneham too. Highly recommended, and not just for history lovers. The Forgotten Village is told in two time periods, the 1940s during WWII and in the present day. In the present, Melissa becomes intrigued by a photo of a lady taken in 1943 just as the village of Tyneham is requisitioned for troops during WWII. I was disappointed by this book. The requisition of Tyneham was merely a setting for the Standish's and I felt they could have been anywhere. I would have liked to read more about Tyneham and the war effort. The present day characters of Melissa and Guy The Forgotten Village is told in two time periods, the 1940s during WWII and in the present day. In the present, Melissa becomes intrigued by a photo of a lady taken in 1943 just as the village of Tyneham is requisitioned for troops during WWII. I was disappointed by this book. The requisition of Tyneham was merely a setting for the Standish's and I felt they could have been anywhere. I would have liked to read more about Tyneham and the war effort. The present day characters of Melissa and Guy were likeable enough but their relationship was rushed and a bit cringeworthy. Told with two main narrators in two different points in time – the present day Melissa is in Dorset with her boyfriend Liam, enjoying a short holiday – or they would be if Liam wasn’t always somewhere else leaving Melissa to her own devices. Struggling for something to do, as she’s not included in Liam’s stuff – Melissa spots a notice for a grand reopening of a coastal village, requisitioned by the Ministry of Defense in World War II, and despite not being a ‘history’ person – off she goes. The Told with two main narrators in two different points in time – the present day Melissa is in Dorset with her boyfriend Liam, enjoying a short holiday – or they would be if Liam wasn’t always somewhere else leaving Melissa to her own devices. Struggling for something to do, as she’s not included in Liam’s stuff – Melissa spots a notice for a grand reopening of a coastal village, requisitioned by the Ministry of Defense in World War II, and despite not being a ‘history’ person – off she goes. The tiny village of Tyneham has been uninhabited since 1943, people just left with some basic things, believing they’d return at the end of the war. For 75 years, the only growth was in dilapidation and mold. But, with a television-presenter historian giving a chat, and an intriguing photo in the church that has ‘before they left’ photos displayed, leaves Melissa intrigued, questioning and investigating. Easy to read - light and entertaining even with the abuse, several twists lead to a satisfying conclusion for both Veronica and Melissa, even as the pathway through the muck isn’t always clear. Clear descriptions, solid, if not quite brilliant, characters and a sense of things forgotten or discarded over the years makes for an intriguing debut and promises good things for this author. Over the Bank Holiday weekend I thoroughly enjoyed reading Lorna Cook’s novel The Forgotten Village. The book is set in the village of Tyneham in Dorset, which was requisitioned during the Second World War and the villagers were evicted, never to return, and has a dual timeline. One story plays out during the last days of Tyneham as the villagers prepare to move out and Lady Veronica looks to seize her only chance to escape from her violent and brutal husband, Sir Bertie — only to be thwarted at Over the Bank Holiday weekend I thoroughly enjoyed reading Lorna Cook’s novel The Forgotten Village. The book is set in the village of Tyneham in Dorset, which was requisitioned during the Second World War and the villagers were evicted, never to return, and has a dual timeline. One story plays out during the last days of Tyneham as the villagers prepare to move out and Lady Veronica looks to seize her only chance to escape from her violent and brutal husband, Sir Bertie — only to be thwarted at the last minute by the arrival of Bertie’s brother. In the present, newly-single Melissa and handsome celebrity historian Guy meet for the first time on a visit to the forgotten village, find a photograph of the old days and set out to track down the story behind it. The concept — dual timeline, lost village, past secret unearthed in the present — isn’t original but I did find Lorna Cook’s telling of her tale appealing. The older story had everything. There was drama, there was passion, there was betrayal, there was death, all playing out against the background of war and a sense of impending doom. The present day story couldn’t hope to match it, and for me the book suffered a little from that, as Melissa and Guy’s tribulations seemed very frivolous compared to those that had gone before. I’m afraid I didn’t really engage with either of them in the way I did with the hapless Lady Veronica and I tended to race through the modern scenes to focus on the compelling story in the past. The book bills itself as: “the most gripping, heartwrenching page-turner of summer 2019” and I felt that it was overselling itself a little. The way one story overshadowed the other made it feel a little unbalanced: I would have liked a little more action — and drama — in the present. Melissa’s relationship problems passed with little more than a shouting match and a lot of internal agonising while Guy’s (I can’t give detail without spoilers) mostly played out off the page. So in short, I think I would have liked an added dimension, but I did enjoy the story of Tyneham in the 1940s, so much so that I think it would have made a terrific novel in its own right, with the opportunity for a little more development of the characters involved. That apart, it was most definitely an enjoyable read, well-written and nicely set. The Forgotten Village has the kind of premise that immediately attracts my attention: dual time frame and with a historic point of interest. As I expected, I loved it! In the modern day story we have Melissa. A pretty young woman, she's holidaying in Dorset with her boyfriend of only a few months, Liam. But Liam is seriously neglecting her, opting to spend his days surfing instead of spending time with Melissa. So she takes herself off to Tyneham for a look around the village which has just been The Forgotten Village has the kind of premise that immediately attracts my attention: dual time frame and with a historic point of interest. As I expected, I loved it! In the modern day story we have Melissa. A pretty young woman, she's holidaying in Dorset with her boyfriend of only a few months, Liam. But Liam is seriously neglecting her, opting to spend his days surfing instead of spending time with Melissa. So she takes herself off to Tyneham for a look around the village which has just been opened up for the first time since the war. It was requisitioned by the Ministry of Defence - yes, that's the whole village including church, school, manor house and every villager's home. Hard to imagine, but everybody had to simply up and leave. They expected to go back after the war but it never happened. It's heartbreaking really. At Tyneham, Melissa's path crosses with that of Guy Cameron, a TV historian and they end up getting to know each other. Melissa becomes fascinated by a photo of Sir Albert Standish and his wife, Veronica. Something seems a bit off about it and Melissa can't put it out of her head. She and Guy do some investigating and try and find out more about what happened back in 1943. Both stories are compelling and there's plenty of intrigue and mystery surrounding what happened just before the requisition. Melissa and Guy go on a fact-finding mission and I loved how they uncovered the truth bit by bit. The Forgotten Village is not a story of war particularly, but of something that happened because of the war and the way it affected so many. There are love stories, there is history, there are secrets. Honestly, what more could you want? For a debut novel, it's an extremely well-written story, plotted perfectly to keep the reader guessing, and having the backdrop of an abandoned village, both in the past and the modern stories, made it so very interesting. It's not a short book at 400 pages but I can honestly say that it whizzed by and I didn't want to put it down. I'm looking forward to what Lorna Cook writes next. The Forgotten Village by Lorna Cook is a time slip novel set both in the present day (2017) and during World War 2. Regular readers will know that I absolutely flipping love a historical book and I go crazy for a dual timeline so I was very excited to read The Forgotten Village. I loved the premise and setting of this novel; Tyneham, a village in Dorset which was requisitioned by the army during the war and the inhabitants forced to leave, expecting to return once the war was over. But, it remained owned by the army and has gradually fallen into disrepair until now, when it has been re-opened as a visitor attraction. It is here that we meet Melissa, a young woman on holiday with Liam, her boyfriend. She has taken herself off for the day as Liam seems more interested in surfing than he does with spending time with her. Whilst there she meets Guy, a TV historian and together they begin to uncover the secrets buried at Tyneham. Tyneham is a living, breathing place in The Forgotten Village and I was swept away by the descriptions of the village during the war and that of Tyneham House, the home of Lady Veronica Standish and her husband, MP Sir Albert Standish. I could imagine this house high on the Dorset cliffs towering over a small cove and was transported back in time to a beautiful and sumptuous house. I was almost bereft when reading the descriptions of a dilapidated and dangerous Tyneham House in the modern day and was intrigued about what had happened in the intervening years. It is at Tyneham House where most of the action takes place and there are passages which make for difficult and upsetting reading. When we meet Lady Veronica she is planning to leave her husband and Lorna Cook shines a light on issues that were not freely discussed in the 1940s and writes it both sensitively and beautifully. The contrast between Veronica and Melissa is stark; Veronica appears to have everything but she doesn’t have the freedom that Melissa has and I enjoyed this quiet examination of the role of women and how it has changed over the years. In the present day the burgeoning friendship between Guy and Melissa is very sweet and heartwarming. I really enjoyed the slow build between them as they investigated what had happened in the past and unpicked the threads of history. Melissa and Guy are both wonderfully written characters whose present is being affected by their past. I loved their fragility and how sensitive and kind they both are, especially when faced with difficult choices. Thank you to Netgalley, the publisher and the author for the opportunity to read this book in return for review based upon my honest opinion. This book was a fantastic book. It was a dual-timeline story, set in the present and 1943 in the village of Tyneham and surrounding areas. When Melissa’s get away with her boyfriend goes astray she finds her self with lots of time and decides just on chance to check out the reopening of the town of Tyneham that had been requisitioned during wartime and wa Thank you to Netgalley, the publisher and the author for the opportunity to read this book in return for review based upon my honest opinion. This book was a fantastic book. It was a dual-timeline story, set in the present and 1943 in the village of Tyneham and surrounding areas. When Melissa’s get away with her boyfriend goes astray she finds her self with lots of time and decides just on chance to check out the reopening of the town of Tyneham that had been requisitioned during wartime and was just now being reopened. It wasn’t her usual thing to do she’s not really overly interested in history but something about this called to her. From the moment she walked into the town her life was never going to be the same again. She sees a picture at the main house and it something about it just won’t let her go. She was unprepared for her day trip and ends up passing out due to dehydration, she wakes up into the face of a semi famous historiian and TV performer. During this book the two of them keep searching for answers and it turns out that his grandmother may hold some of the answers that Melissa wants to know, she wants to know what happened to Victoria and Albert and why does she look scared in that photo that is at the main house. This is a book in two time periods. In the present we have Melissa who is having possibly her worst ever holiday with boyfriend, Liam. Alone again while he surfs, Melissa ends up at an open day for the lost village of Tyneham. Something strikes a chord with her in one of the pictures and she heads off on a historical hunt to find out the truth ably helped by Guy. In 1943 the village is due to be abandoned to the military and all is not well at the hall. The theme of forgotten or deserted villages This is a book in two time periods. In the present we have Melissa who is having possibly her worst ever holiday with boyfriend, Liam. Alone again while he surfs, Melissa ends up at an open day for the lost village of Tyneham. Something strikes a chord with her in one of the pictures and she heads off on a historical hunt to find out the truth ably helped by Guy. In 1943 the village is due to be abandoned to the military and all is not well at the hall. The theme of forgotten or deserted villages has been used several times in fiction. “What Lies Beneath” by Sarah Rayne being a particularly good one. If you exclude the forgotten village part of the story then actually this is quite a well used storyline with obvious plot devices. This made it predictable from start to finish. The background setting made this slightly more unusual but all the same a well worn plot. I did, however, enjoy this book despite this. I found it light & easy to read with a story that flowed well. The two time periods are clearly different allowing for no confusion. The characters are reasonable but not brilliant. I would class this as a good holiday read – easy to pick up and put down. It is easy to keep track of and flowed well. I enjoyed it for what it was but it won’t be one I shall bother revisting. I would consider reading more by this author but won’t be actively seeking them out. The village of Tyneham, Dorset, which the British Military requisitioned in 1943, is the central location to this novel. The story jumps to 2017 when a young couple, Guy and Melissa set out to solve the mystery as to what happened to the owners, of the manor house at Tyneham, Sir Albert and Lady Veronica, when they find it impossible to trace any death certificates or in fact, any evidence of their existence after leaving Tyneham. Guy's elderly grandmother,Anna, was Lady Veronica's maid and seem The village of Tyneham, Dorset, which the British Military requisitioned in 1943, is the central location to this novel. The story jumps to 2017 when a young couple, Guy and Melissa set out to solve the mystery as to what happened to the owners, of the manor house at Tyneham, Sir Albert and Lady Veronica, when they find it impossible to trace any death certificates or in fact, any evidence of their existence after leaving Tyneham. Guy's elderly grandmother,Anna, was Lady Veronica's maid and seems to be keeping a seventy year old secret. I enjoyed the book and it flowed nicely although i feel that it would appeal more to readers who want a romance novel, as the story concentrated more on the relationship between Guy and Melissa, rather than the events at Tyneham and the mystery at hand. An engaging dual timeline story, we follow Lady Veronica and her husband during WW2, and Melissa and tv personality/historian, Guy, in the present day. Visiting the village of Tyneham that has just been reopened to the public following its requisition by the military during WW2, Melissa becomes fascinated by a photo of Lady Veronica and with the help of Guy, attempts to uncover the truth behind it. The duality of the story is handled really well, and although I preferred the present day character An engaging dual timeline story, we follow Lady Veronica and her husband during WW2, and Melissa and tv personality/historian, Guy, in the present day. The duality of the story is handled really well, and although I preferred the present day characters and their bubbling romance, the historical sections were strong too. It was fascinating to learn about the village of Tyneham, as I hadn't known anything about it until reading this book. This story is a mystery with lots of interesting history going on. I was drawn into the story as the WWll aspect unfolds with the requisition of the village called Tyneham. Told in duel timeline of 1943 and 2017.....to bring the past and present together, makes this story fascinating. What an incredible intriguing story this is as you watch it all unfold. So many twists and turns, so much mystery going on. Very well planned out, believable characters that will captivate you right from the first p This story is a mystery with lots of interesting history going on. I was drawn into the story as the WWll aspect unfolds with the requisition of the village called Tyneham. Told in duel timeline of 1943 and 2017.....to bring the past and present together, makes this story fascinating. What an incredible intriguing story this is as you watch it all unfold. So many twists and turns, so much mystery going on. Very well planned out, believable characters that will captivate you right from the first pages to the last pages. A dual timeline book, which is a genre I enjoy. This story takes place in the 1940's and today and is tied to a village that was requisitioned for the War effort. I found myself enjoying both timelines in The Forgotten Village. There was a simple story and I have to say that it was fairly predictable. There was a twist near the end that I had guessed quite a lot earlier in the book. Having said that, it was still a pleasant story to read. Thanks to NetGalley for a copy in exchange for an honest rev A dual timeline book, which is a genre I enjoy. Thank you Netgalley for providing me an ARC of this book in exchange for an honest review. This book was not what I expected. As I read the description I knew the village in question was going to be requisitioned for troops during WWII and the villagers had to find other towns to live. But I thought - misguidedly - that there would be more about WWII and the role the village in question played during it. I was sadly mistaken. This book had nothing at all to do with WWII and instead it was what I Thank you Netgalley for providing me an ARC of this book in exchange for an honest review. This book was not what I expected. As I read the description I knew the village in question was going to be requisitioned for troops during WWII and the villagers had to find other towns to live. But I thought - misguidedly - that there would be more about WWII and the role the village in question played during it. I was sadly mistaken. This book had nothing at all to do with WWII and instead it was what I would call women's fiction. Domestic abuse takes center stage here so if you are squeamish about that you may want to give this a pass. Sign up to my newsletter via my website to be the first to hear about my book news, blog posts and to gain acces I write dual-timeline books that weave secrets of the past with the present.